My big focus for this year is planned to be a basic set of ‘Tried ‘N True’ patterns. I think there are several types of TNT. There are ones that emerge from experience. You find a pattern that you love wearing and love making, so you make it again and again. It suits your personal style and your life style and your sewing style. What could be better. I’m returning to clothes making after about 30 years away, so sadly I can’t talk about that special kind of pattern. 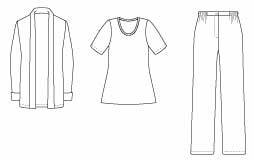 As my wardrobe needs major revitalising, I really need very quick and easy patterns that require minimal sewing skills and little or no fitting, and are flattering and in my style. Is that impossible 😀 Some people base their whole wardrobe round patterns like this. But I think that sort of TNT too is a separate issue. I’m interested in TNTs as a deliberately developed ‘core wardrobe’ of well fitting patterns, for each of the types of garment you wear. So what should I be working on ? There was an inspiring strand at Stitcher’s Guild where people said what was their absolute minimum set of basic patterns. And it was interesting what different ideas people came up with. I would love to have all the confidence about fit and technique that such patterns can give. I’m also interested in simple style patterns because they allow for a wide range of variations without having to do all the fitting again to get a ‘new’ style. Shirley Adams of Alternatives has this idea. She provides patterns for a basic shell and vest, and for fitted and dropped shoulder loose jackets. She has a vast range of pattern add-ons, extension pieces which change design elements such as necklines and sleeves, or which add to the basic shapes to make a wide range of other styles, such as blouses, dresses, and fitted jackets. These are the patterns I’m using for some of my inspiration. Nancy Erickson of Fashion Sewing Group provides more formal classic patterns with similar flexibility. Her instructions about variations are in her booklets and newsletter. Her patterns are intermediate in difficulty for fit and sewing, so I’m planning to use them later. For a simpler starting point on how to make small pattern changes, there’s the Easy Sewing the Kwik Sew Way book. Or the MacPhee Workshop patterns : 335 for knit tops, 305 for shirts and shirt-jackets, and 30 for jackets, are individual patterns specifically oriented to making simple style changes. And for another ingenious way of trying your own variations, there’s the Brensan Studios Shirt Club patterns in which you can use any body with any sleeve. There are Big 4 patterns that have that idea too – design elements which you put together in your own combinations : the Project Runway patterns from Simplicity, and some of the Crafty and DIY Style patterns from McCall’s. yes, and for me that means fitted not elastic waist. I’m better in styles with darts and fitted shoulders, so will start with a fitted blouse. I like yokes, so plan to fit a looser shape shirt later. I think Shannon means a knit tee. I don’t wear them except as underlayers. Closely fitted knits are not flattering on the small busted. So I will go for a short sleeved woven top here. I think Shannon means a ‘proper’ jacket, but I don’t look or feel good in structured tailored or notched lapel collar styles. Learning to fit and make a more advanced jacket isn’t one of my basic needs. As a first step, I.m going for an easy unstructured jacket, unfitted and collarless. At this stage I’m not going to worry about skirts as I rarely wear them. A basic pattern is easy to adapt from the waist and hips of a pant pattern. I also don’t wear dresses or jumper dresses, which are essentials for many people. My first focus needs to be on styles which it’s easy to make small styling alterations to. If you just wanted to use the minimum of co-ordinating patterns, you might look for a wardrobe pattern. with her Butterick 5300 blouse. Most Butterick-McCall’s-Vogue wardrobe patterns have a strongly styled jacket, so would not be good for variations. Simplicity-New Look wardrobes include a much bigger selection of simple patterns which could be restyled, and suit a wide range of personal styles and body shapes. Among independent designers, Textile Studio patterns (many originally designed by Loes Hinse) are simple soft classics. Sadly, comparing my fitting sloper with them shows that they would be a lot of work to fit for me. I think they were designed for a different body shape, perhaps an inverted triangle. But I know many people happily base their wardrobes on Loes Hinse’s patterns. – making small pattern changes.to design elements such as necklines, collars, dart distribution, sleeves, cuffs, etc.. though not to the overall shape, fit or ease of the body of the garment. With those TNTs sorted out, that should be my main fitting problems understood. So I might use other patterns with more confidence that I knew the alterations needed to get a good fit. Much later I might go through another TNT cycle, preparing more formal styles with more advanced sewing and fitting techniques. P.S. Elizabeth has started a strand at Stitcher’s Guild in which people list their TNT patterns. This entry was posted on January 22, 2010 at 10:51 am and is filed under fit of clothes, my choices. You can subscribe via RSS 2.0 feed to this post's comments. Both comments and pings are currently closed. Another great post, Lisanne. Have you nosed around the Vogue Woman patterns? There are some really good patterns in that line, I think, especially with loose jackets. Regarding sewing and fitting skills: IMHO, these aren’t really the same. I think maybe you should pick a few patterns you really *like*, and get some help with fitting them. The sewing skills, I truly believe, are not the most difficult part.